The Chihuahua is highly intelligent, alert, swift and fearless. Chihuahuas are obedient and easily trained. They can be aggressive towards other dogs and do not appreciate humans who invade their homes without permission. Families with young children need to supervise the interaction between children and Chihuahuas, due to their small size. They are ideal companions for the elderly and despite their tiny size Chihuahuas have a tremendous spirit and are far from delicate. 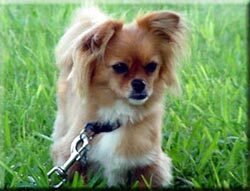 Short coated Chihuahuas only need occasional grooming with a rubber brush, whereas long coated Chihuahuas should be groomed normally with a brush and comb. Eye drops may need to be administered to prevent tear stains. Due to the small size of Chihuahuas they usually get sufficient exercise indoors. This breed originated from the state of Chihuahua in Mexico and the forebears can be traced back to the 9th century. One of these being the Techichi a larger stockier dog who, when crossed with a hairless variety from Asia, produced the long and short coated varieties. In the early Aztec culture, Chihuahuas played an important role in the religious ceremonies. They believed that the sins of a dead person were transferred to a dog, therefore when the master died the dog was also killed. The rich cherished this breed, however the peasants valued them for a different reason, as these tiny dogs often ended up in cooking pots. General Appearance: Alert, tiny, defiant and graceful. Color: Any color or mixture of colors. Coat: Smooth coat - Smooth, close and glossy. Long coat - Flat or slightly wavy with feathering on the ears, tail, neck and feet. Tail: Long, set high, curved over the back and tapering. Ears: Large, well seperated, carried erect when in motion and set at a 45-degree angle when at rest. Body: Short, level back, well sprung ribs and shoulders well laid back. There are two versions of the Chihuahua, one of which is smooth-coated and the other being long-coated. Apart form their coat they are identicle. Chihuahuas feel the cold and a small coat is usually needed during winter or cold weather.